As promised, here is Part 1 of my Weekend of Beauty Treatments series. And what better way to start off the weekend than with the Elle of a Pedicure at Dashing Diva? 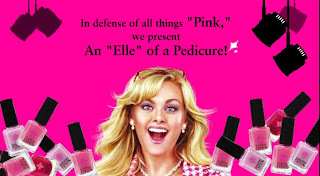 This new, limited-edition pedicure celebrates -- who else -- the fabulously perky and peppy Elle Woods from Legally Blonde, and incorporates tons of pink products so you'll feel just as ready for Harvard Law School (or just a night out on the town). I headed to the Upper East Side location after work on Friday to totally pamper my legs and feet. This pedicure lasts for an hour, fellow beauty chicks -- and considering most nail places in NYC like to get you in and out in 30 minutes, this was a rare treat! So I settled into the pink tweed couch -- cosmopolitan in hand -- and prepared to be pampered to my heart's content. And let me just tell you, I was not disappointed! My pedicurist, Sabita, was absolutely amazing from start to finish. She kneaded the kinks out of my calves, scrubbed and buffed until my nails shone, and otherwise treated me like royalty. The treatment started with a quick soak in a bath filled with fragrant pink flowers. Soon after, Sabita wrapped my feet in plastic wrap and hot towels with the cotton candy scented Delta-Nu Pink Masque, which helped to soften the skin while she prepared the JellyBath. JellyBath, you say? What on earth could that be? Well, I'll tell you -- it's a Legally Pink Elixir, formulated with ylang ylang, that's poured into the tub of water. It forms a jelly-like substance that, once touched by your feet, suctions around them and helps to smooth and exfoliate. It sounds scary and not quite so delectable, I know ... but trust this beauty chick when she tells you that it feels amazing. It's a mass of soft bubble-like consistency that just conforms to your feet and legs and leaves them feeling seriously supple. Next, Sabita gave me the most unbelievable leg massage while rubbing in the Legally Pink Summer Scrub and the "Elle" of a Body Butter ... both pink, of course, and both smelling absolutely divine! Then came the filing and shaping of the nails, and then -- of course -- came the polish. While you can elect to have your toes polished with the Blonde Pink nail polish, I elected for Carrot Top Coral -- an electrifying shade of orange that just screams summertime fun in the sun. This pedicure is available for a limited time only at all Dashing Diva locations. (Check out Dashing Diva's website to get the full scoop.) All in all, was it worth the $65 price tag? Definitely. You'll feel seriously pampered, your toes will look incredible, and you'll walk out feeling fabulous. And isn't that what Elle Woods would have wanted? Stay tuned for Part 2 of this series, coming up tomorrow morning!